200 photographs to relive the exuberance and the lightness of the Sixties. Bibliothèque départementale des Bouches-du-Rhône, Marseille. 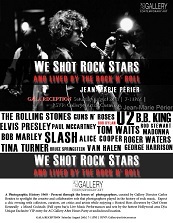 A Photographic History 1960 - Present through the lenses of photographers, curated by Artist's Corner Gallery Director Carlos Benitez to spotlight the creative and collaborative role that photographers played in the history of rock music. 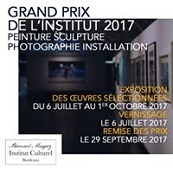 Candidate for the Grand Prix 2017 at Institut Culturel Bernard Magrez in Bordeaux. Unpublished prints from the series Sub Noctem. 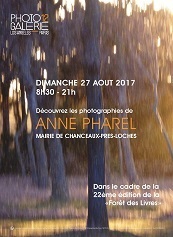 Exhibited at the Town Hall, Chanceaux-près-Loches in conjunction with the 22nd edition of the Festival La Forêt des Livres. A light cube sculpture is part of the exhibition De nature en sculpture (Of Nature Sculpture) at Fondation Villa Datris. Winner of the RAM Sarteano Award at MIA Photofair Milan in exhibition at the Crete Senesi in Sarteano, Tuscany. At Photo12 Galerie Paris. In participation of the Second Biennale des Photographes du Monde Arabe. In conjunction with Maison Européenne de la Photographie and Institut du monde arabe. You receive this newsletter from PHOTO12 GALERIE. Copyright © Photo12 Galerie, All rights reserved.